This kit is used to connect a transom mount push-pull steering system to 1993 (ET) and newer 9.9/15 model Evinrude® and Johnson® outboard motors. In addition to this kit and the helm and steering cable, you will need a Transom Bracket Kit, P/N 172645, a Clevis Kit, P/N 173209, and mounting bolts for the bracket kit. Fold steering lever up. Position kit Steering Bracket (1) on the motor steering bracket (A) and insert Screw (2) down through both parts. Install Locknut (3). Tighten screw to 10-12 ft. lbs. (14-16 Nm). Connect clevis (B) from the clevis kit to the front of the steering bracket and tighten screw to 15 ft. lbs. (20 Nm). Install locknut from clevis kit on the screw and tighten to 20-25 ft. lbs. (27-34 Nm) while holding the screw. 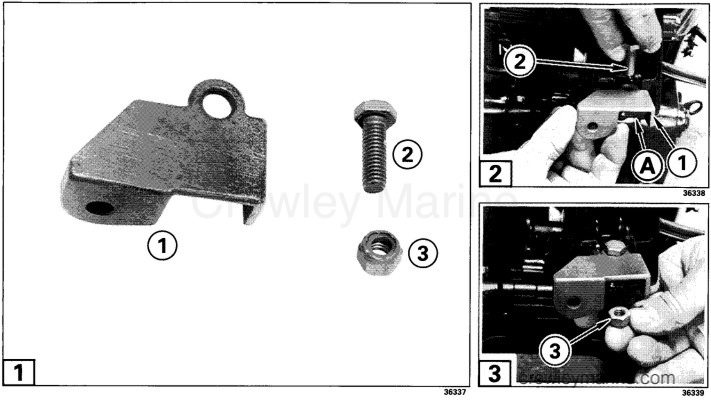 Connect clevis (C) from the clevis kit to the rear of the steering bracket and tighten screw to 15 ft. lbs. (20 Nm). Install transom bracket kit to the port or starboard side of motor as required, following the kit instructions. 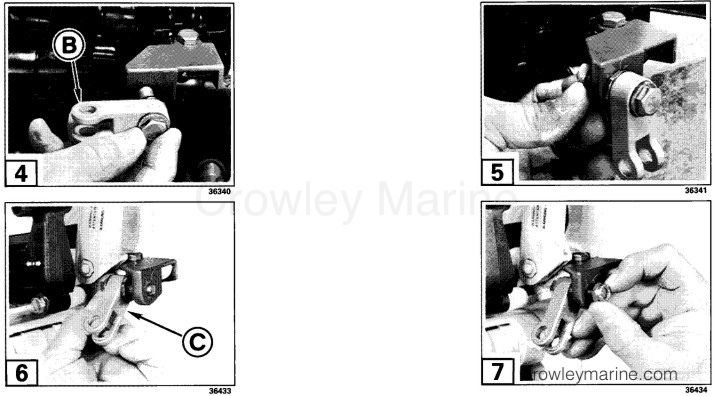 When connecting the steering cable to the clevis, tighten locknut (D) to 72-96 in. lbs. (8-11 Nm), and then loosen 1/8 turn. Adjust steering tube to provide equal steering in both directions. Retighten steering cable nut. When installation is complete, check for interference between steering components and the motor, boat, and accessories from lock-to-lock in both the running and tilted positions. Correct any interference before operating the boat. Any interference could cause steering damage and loss of control if the motor strikes an underwater object and tilts up. When replacement parts are required, specify genuine Evinrude/Johnson parts or parts with equivalent characteristics including type, strength, and material. Failure to use equivalent parts could result in product malfunction and possible injury to operator or others.